What do you do when a problem is also a solution? Such is the case with exotic tamarisk (a.k.a., Tamarix spp., saltcedar), criticized for its ability to take over riverbanks, salinize soil, increase fire risk, and trap river sediments, among other ills. Tamarisk was introduced to the Western U.S. from Eurasia in the late 1800s, and over the next 50 years it was widely planted as a fast-growing, drought-resistant ornamental and riverbank stabilizer. However, the negative impacts of the tree were increasingly evident, leading to the passage of a national bill to address the issue. 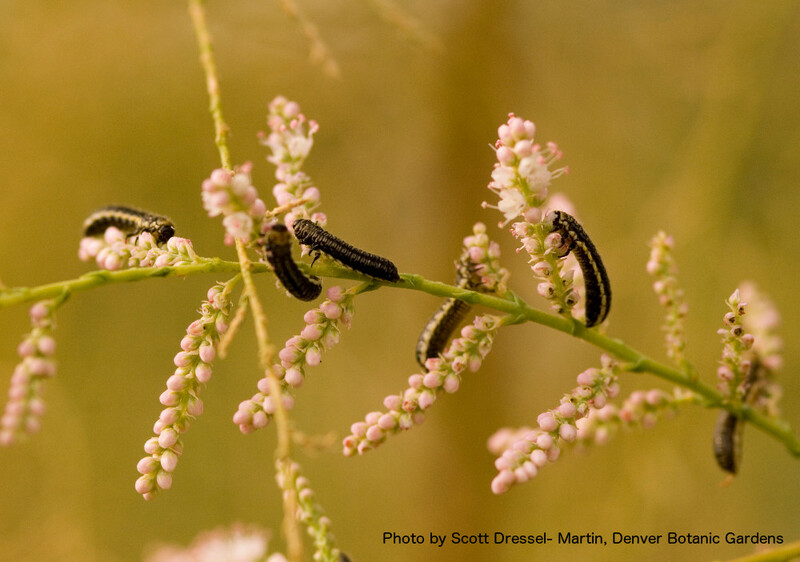 Among the actions taken to reduce tamarisk populations was the development of a biological control agent, the tamarisk leaf beetle (Diorhabda spp. ), which eats the leaves in both its adult and larval (pictured above) stages. It was released in 2003 and currently is rapidly spreading, leaving a sea of defoliated tamarisk in its wake. Except there was a problem, and not the one you might expect. 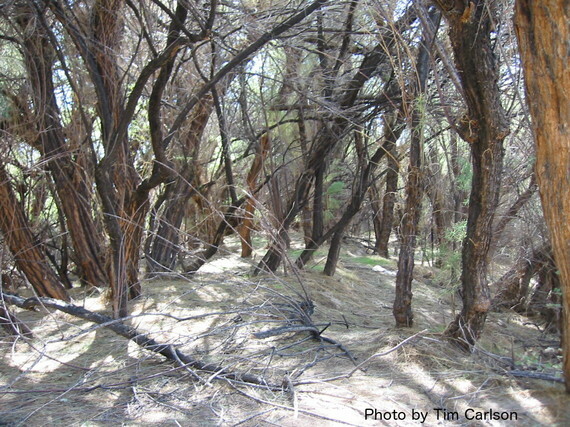 Most aspects of the beetle release were positive: the beetles kept true to their target, leaving native species to recover in the understory of the dying tamarisk trees. They also found their place in the food chain, being prey to both ants and birds. The problem was that tamarisk had become habitat to a number of bird species, including the federally listed endangered Southwestern Willow Flycatcher (SWFL, pictured below). A tamarisk stripped of leaves by the beetle exposes nests to predation, parasitism and being baked by the sun. The U.S. Fish and Wildlife Service (USFWS) and conservation groups voiced their concern early, and a lawsuit was even filed against the Animal Plant Health Inspection Service (APHIS). Nonetheless, the beetles have steadily continued their expansion from Western Colorado and Eastern Utah toward the primary nesting grounds of SWFL in Arizona and New Mexico. Not that tamarisk is good for all birds. Many native animal species associated with rivers, such as bald eagles, cannot use it, and the miles-long thickets tamarisk creates blocks native plant species on which many native animal species depend. Surveys of tamarisk monocultures find that they have very different animal assemblages from native or mixed native-tamarisk forests. To address this complexity and its implications, a panel of expert scientists convened this week in Tempe, Arizona, organized by the Tamarisk Coalition, a non-profit formed to promote healthy river ecosystems, and funded by the Walton Family Foundation. The goal of the panel was to come to a consensus about the future of the beetle and how we might best respond to both the opportunities and problems it brings. Also present were other scientists and stakeholder non-profit and government agency representatives. The particular focus was the Colorado River Basin, all the way down to the delta in Mexico, represented by panelist Dr. Osvel Hinojosa Huerta, director of the Water and Wetlands Program, Pronatura Neoroeste. I was there as a plant ecologist who has studied tamarisk since 1992 and recently co-edited a book on the topic, Tamarix: a Case Study of Ecological Change in the American West, published by Oxford University Press. One representative of the U.S.F.W. stated the anxiety of some as "the system unraveling if the beetle migrates into the Lower Colorado [river]." When I asked her if any of the data being presented suggested that such an unraveling was imminent, she responded: "Isn't that why we are here?" Certainly the beetle causes ecosystems to change, but several of the specific fears (and hopes) were revealed by the panel to be overreactions. In particular, the dry branches and dead leaves left by the beetle do appear to increase fire intensity initially, but after even one burn, and in the long term the beetle is expected to decrease fire risk by reducing the cover of the highly flammable tamarisk trees. "Areas where tamarisk are dominant are much more likely to have fires that expand beyond the riparian zone [including to houses and other buildings] than places where they are absent," explained Dr. Gail Drus, a fire ecologist who did her dissertation on tamarisk. "They also increase a fire's harm to native trees by acting as a ladder to the canopy." She continued, "The beetles should help with these problems." Further, dead trees do not hold the soil well, leading to both concerns and hopes that the beetle will facilitate rivers expanding to historic widths. However, recent studiesby panelist Dr. Rebecca Manners (Geoscience Department, University of Montana) and others show that erosion of riverbanks is likely to be gradual rather than dramatic. Most rivers no longer flow with the force they once did, especially if they are regulated by dams or other structures. To this point, one problem we all agreed on was that increasing human demand for water has both facilitated tamarisk invasion and threatens birds. Declining surface and groundwater in the arid Southwestern U.S. has made many regions inhospitable to any tree species other than tamarisk. If the tamarisk goes, there will be no trees for birds in these areas, even if other xeric species of shrubs and plants take their place. 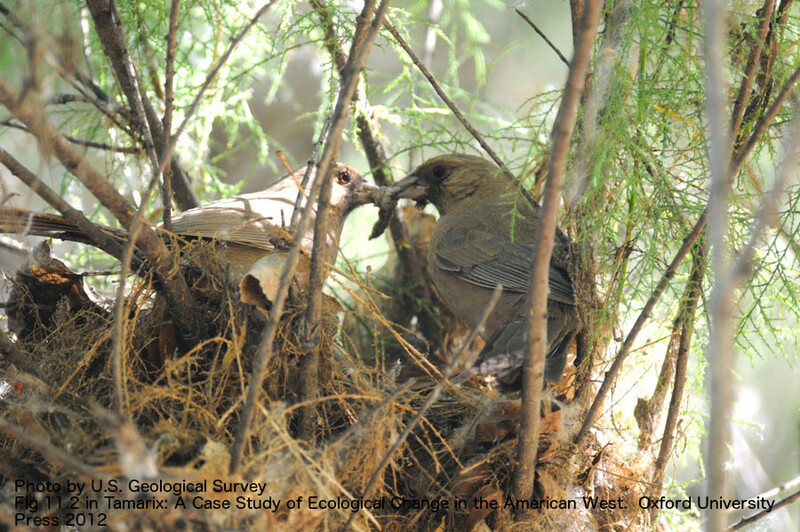 However, SWFL and other tamarisk-nesting birds also need water, so some of these places will not be good habitat regardless of what the beetles do, especially in the context of climate change. How much area falls in the middle ground of harming the birds is yet unknown. Among other points agreed upon were that the beetle is here to stay and its impact will expand. 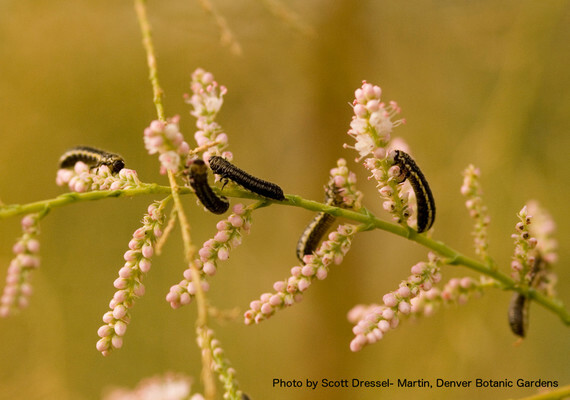 "Tamarisk will not be eliminated, however," explained entomologist Dan Bean, State Biological Control Specialist and Director of the Palisade Insectary in Colorado. "That's not now biological control works." The expectation, rather, is that an equilibrium will be reached in which tamarisk is maintained at lower levels that benefit rather than harm the overall ecosystem. Having some tamarisk under native trees promotes bird diversity by creating more structural complexity. Data was also presented by Matt Johnson, director of the Colorado Plateau Research Station at Northern Arizona University, showing that the bio-control beetles are becoming an important food source for some rare species. Our primary task, therefore, is to promote desirable replacement vegetation whenever and wherever we can, taking advantage of the opportunity the beetles create and mitigating any unintended effects. The panelists' report, expected this spring, is a first step in that direction.